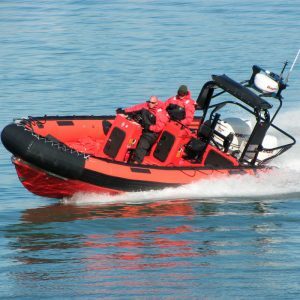 Digital control systems are enabling engineers to wed design with functionality aboard inflatable boats. They’ve become “must-haves” even in the world of inflatable boats. It’s not posturing, nor a desire to imitate “mini-yachts,” but simply a straightforward question of practicality: onboard functions are growing exponentially, and certain comforts are highly appreciated, especially when the inflatable is regularly in use and not simply out on the water a couple of weekends a year. When people purchase an inflatable (especially larger models), these comforts are now almost always supplied standard right from the shipyard. 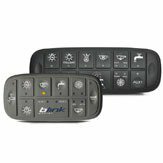 Designed for even the harshest conditions, Blink Marine CAN keypads withstands the cleaning force of pressure washers and holds on IP67 rating, making a immune to waste, mud, soil, sand, oil, chemicals or anything else thrown at it. 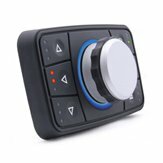 It’s undeniably convenient to have the commands for various onboard functions all united on a single keypad. And when this panel, in addition to being fully functional, can boast a modern, attractive look as well, who could deny its inherent value? The function of the ruggedized keypad is to allow the operator to run the many accessories and/or services that rely on 12V or 24V current independently. 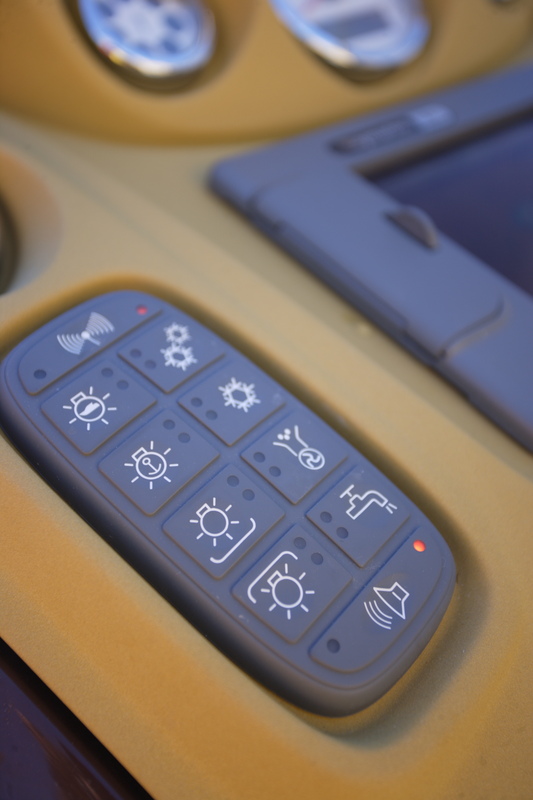 The layout of the controls for onboard functions relies on a more or less consistent number of LED-lit keys, making it possible to see immediately which functions are currently active. For example, the key for the bilge pump would remain on if the pump is accidentally left on, avoiding the risk of burning out the pump; or another key if the internal cabin lights remain turned on for a long time while the boat is at anchor and its passengers sunning in the bay, avoiding the risk of depleting the batteries. The keypad would immediately show when the refrigerator has been deactivated, making it possible to intervene in time to keep the contents from deteriorating, or at least losing freshness. A little light turned on beneath the switch can be a panacea: LED turned on = function on; LED turned off = function off. 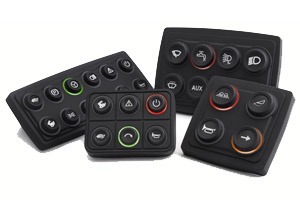 Keypads in the PowerKey PRO series can be customized to fit individual needs according to both onboard functions and the space available on the console. The keypad is mounted on the console in a position that’s easy to reach by the captain or whoever else is operating the boat, without requiring the operator to remove both hands from the wheel, which can be gripped firmly with the other hand. Different shapes and materials are available on the market (generally metals that have been painted, sometimes frosted, as well as models in ABS or PVC)… Which one is right for you? There’s no single model that’s perfect for everyone: the choice depends on needs and budget. Generally speaking, you should look for a model that has a number of keys sufficient for your needs. Too few keys and you won’t be able to cover all the boat functions; too many and your keypad may take up too much space on the console. It’s also important that the keypad fit within the helm, but fortunately today’s market offers models that can be adapted to even the smallest spaces. 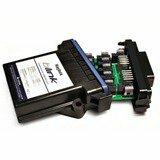 Blink Marine offers excellent preconfigured systems intended for small- and medium-sized boats that bring together all the functions typically found on these boats. 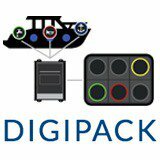 The Milan-based producer recently launched “DigiPack,” a new (CAN protocol) digital switching system that Blink Marine developed specifically for the leisure boat nautical sector. The DigiPack is an extremely versatile system that’s easy to configure and install, and is intended for both shipyards looking to add value to their boats, as well as for individual inflatable boat owners who are busy refitting their boats. 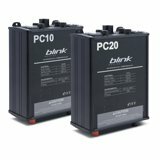 The system is made up of one or more digital keypads from the PowerKey and/or PowerKey PRO series, combined with one or more power control units (PC10), or a CAN bus relays module (Keybox). Combining keypads and power units makes it possible to obtain four different “Packages” that Blink Marine has designed in order to respond to the different market needs currently emerging. “Package 1” and “Package 3” are those best-fitted to refitting projects, and utilize PowerKey PRO digital keypads. Today the ability to control functions through a digital switching system represents a clear step forward compared to traditional electrical systems. In the image above, an example such a system installed on a Sessa Marine inflatable. Thanks to icons mounted on removable inserts, keypads in the PRO series can be configured individually at no extra cost. This means that anyone who needs just one keypad can buy the right package without having to face added costs for key customization. The four models in the PRO series vary from 4 to 12 keys. The difference between the two systems (which justifies the different price ranges) can be found in the Keybox: a CANbus relays module that has more limited capabilities than the PC10, or main power control unit. Nevertheless, the versatility of PowerKey PRO keypads is interesting not only for refitting projects, but also for shipyards that need to manage a great deal of variations within a limited number of models. Systems that use CAN PowerKey keypads are most useful for small- and medium-production levels, because the cost of tooling the custom rubber insert (in other words, laser-printing the icons and openings required for LED lights) makes them relatively uneconomical for people looking for just a single model. In order to overcome this difficulty, Blink Marine has created preconfigured keypads designed to meet the control needs of the most common functions found onboard inflatables and small-sized boats (controls for the bilge pump, anchor, horn, sound system volumes, refrigerator, etc.). Boasting only Italian-made components, Blink Marine’s digital systems have made ease of configuration and installation their most significant strongpoint. Company technicians need just three pieces of information to start creating a customized keypad: a list of functions, the wattage of each function and the type of circuit. last but not least, inflatables with a cabin appreciate the convenience of having a double set of keys available both above and below deck. Tell us what you need and we’ll create a digital system that’s perfect for you.